The Long Island Bridge was shut down in 2014 amid safety concerns with its structure. 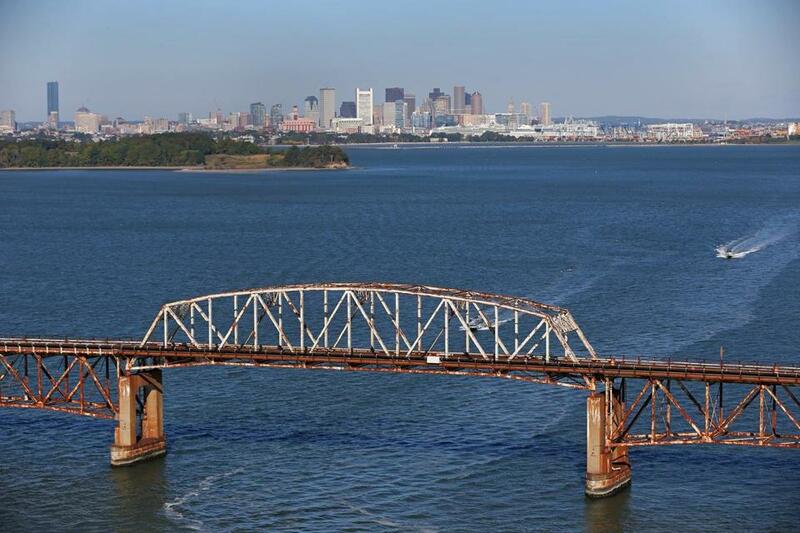 Mayor Martin J. Walsh’s major announcement at his inauguration that he will rebuild the Long Island Bridge has already hit a snag. Quincy Mayor Thomas P. Koch said Tuesday that his city should have a “seat at the table” as Boston moves forward with plans to build a new bridge, saying his constituents would be most affected by an influx of traffic. Use a ferry, they have argued. In the past, to get by road to Long Island, one of the largest in the Harbor Islands, drivers had to go through the Squantum neighborhood of Quincy, over a causeway to Moon Island. And from there, they would span the bridge to Long Island, where the city once housed a homeless shelter and rehabilitation programs. Koch said the drive through Squantum passes through a residential neighborhood, with several “hairpin turns,” and residents there had concerns with the traffic long before the bridge was closed. “I’m hopeful we can look at the water transportation side of this,” he said in an interview. Walsh evacuated the island in 2014 and shut the bridge down amid safety concerns with its structure. At the time the mayor promised to rebuild the bridge immediately, but the project has stalled — and even appeared to fall off the city’s agenda in recent years. But on Monday, the first day of his second term as mayor, Walsh’s promised to rebuild the bridge and restore facilities on Long Island. Not so fast, Koch said. “To stake the future of the island to a new bridge just doesn’t make sense to me — both from a financial perspective and a neighborhood perspective,” Koch said. Koch said Walsh called him on Sunday to alert him about his forthcoming announcement, and he said he has had ongoing communications with the mayor. “Quincy must have a seat at the table,” he said. Any construction of a new bridge may need Quincy’s approval, because Moon Island – the connecting island – is located in Quincy. Koch said he has not reviewed the permitting process, so he could not say what permits would be needed. That may be studied by city lawyers, he said. He urged the city, though, to consider alternatives to the bridge, such as ferries, pointing out that the state Department of Transportation is examining increasing ferry service for commutes into Boston and elsewhere. Quincy’s Marina Bay is on the “short list” for that expansion, the mayor said, and he said officials could propose using Long Island as a regional water transportation hub. “If we’re going down that road as a [strategy] for the Commonwealth, perhaps we should be looking at it for Long Island access as well,” Koch said. A spokeswoman for Walsh said Tuesday that the administration prefers a road over ferries because driving would be more reliable for patients traveling to the island for rehabilitation services, specifically in the winter months. The bridge would be designed in the same manner as the previous structure, which was built in 1951, with a driving lane in each direction and sidewalks, and an open channel for boats to pass below. Long Island was a staple of the city’s homeless and rehabilitation strategies – it housed 742 beds for homeless, and 225 beds for those in recovery programs – until the bridge’s closure in 2014 forced a scramble to relocate those services. The city says it has kept up the infrastructure on the island, investing roughly $6.45 million to maintain and repair electricity, fuel, water, and sewer systems since the bridge’s closure. A new bridge could cost between $40 million and $100 million, according to city projections. City officials could not describe an exact construction date, only saying they would seek necessary permits over the next two years and commence construction once that process is complete. The entire construction could take four years, they said. Matthew A. Cahill, executive director of the Boston Finance Commission, a financial watchdog group, welcomed the plan to reuse the structures on Long Island for rehabilitation programs, noting the city spent more than $75 million there before the bridge was closed, for maintenance ranging from roof repairs to the installation of a sprinkler system. “We’ve seen a lot of taxpayer investment in the buildings out there,” he said. Kathy Abbott, president and CEO of Boston Harbor Now, also welcomed the reuse of the island, saying it is one of the largest among more than 30 that make up the harbor park system. She encouraged the city to incorporate the use of the island into the total design of the park system.